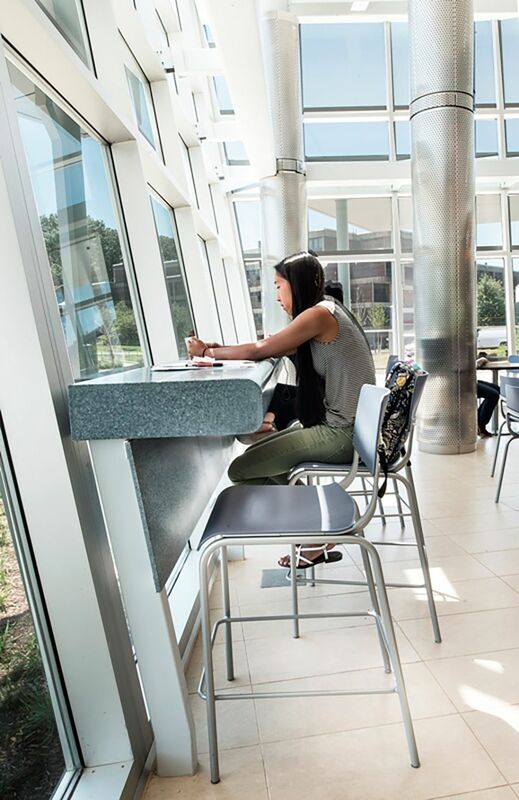 Situated on more than 1,000 acres on Long Island’s North Shore, Stony Brook University was established more than a half century ago and has evolved into a notable research institution. 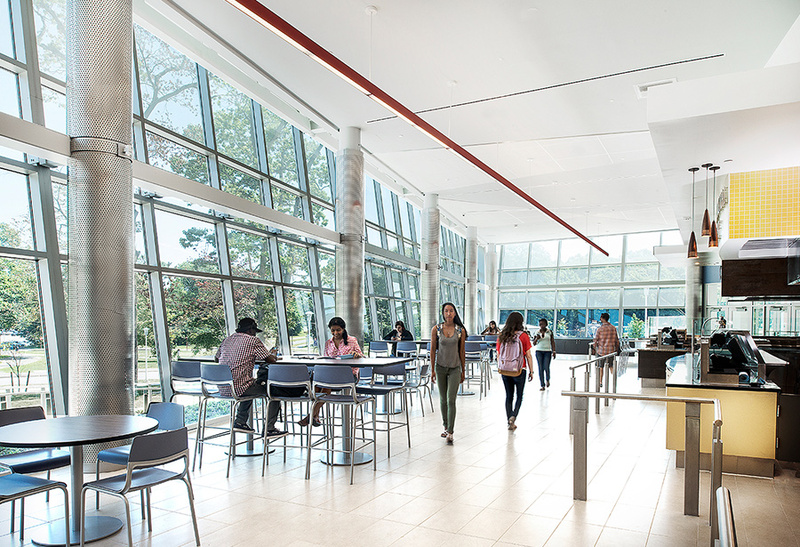 Typical of university dining facilities built in the 1960s, Stony Brook University’s Kelly Dining Hall was a dated, traditional, and daytime-service cafeteria built for another era and student mindset. KSQ was challenged to keep the existing dining hall operational while constructing the new addition. 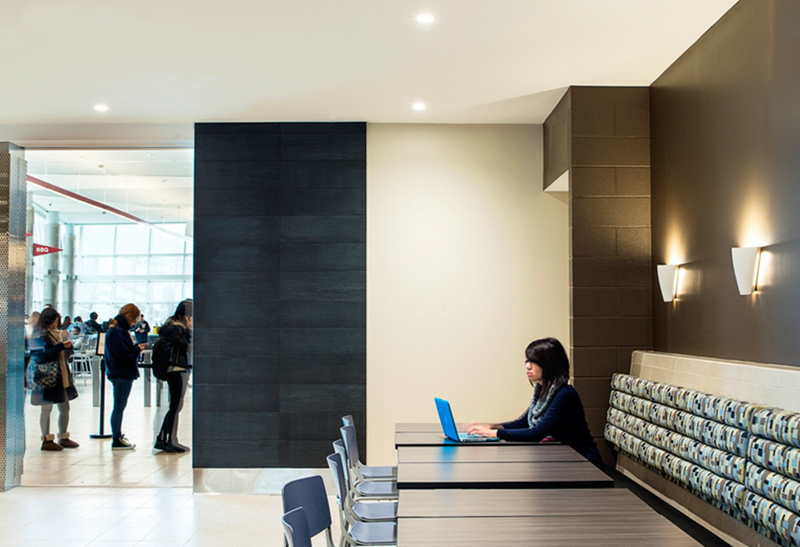 The project also needed to give the building a sense of presence from the street, hide an unsightly loading dock located at a highly centralized point in the design, and offer natural light, diverse dining options and engaging furnishing to encourage student interaction. KSQ’s design has a modern glass “shard” steel and curtain wall envelope juxtaposed against the Brutalist character of the original dining hall that pushes the structure past nearby buildings and creates an iconic architectural element for the university’s West Campus. A garden wall was created to visually block the loading dock access from the road. 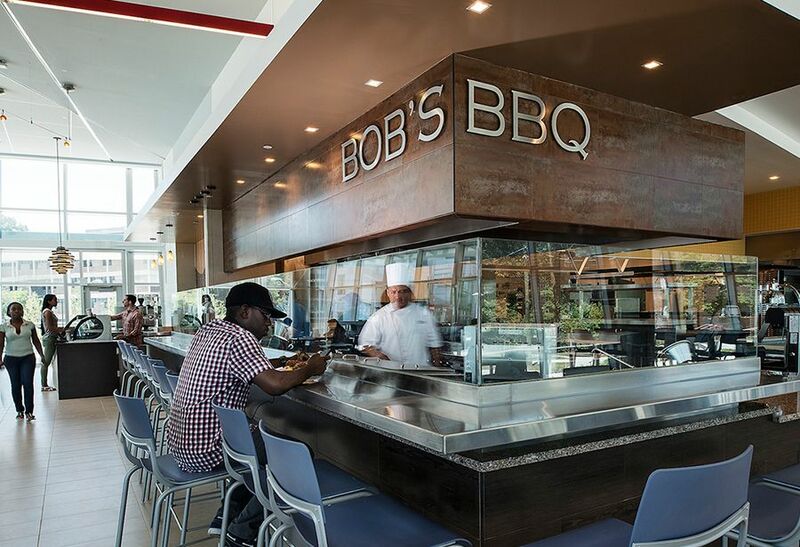 Featuring extensive windows and a striking red light fixture set within the double-volume ceiling, West Side Dining now acts as a beacon in the evening set against a wooded campus backdrop and amplifies the building’s connection to the environment and the pedestrian culture of the campus. 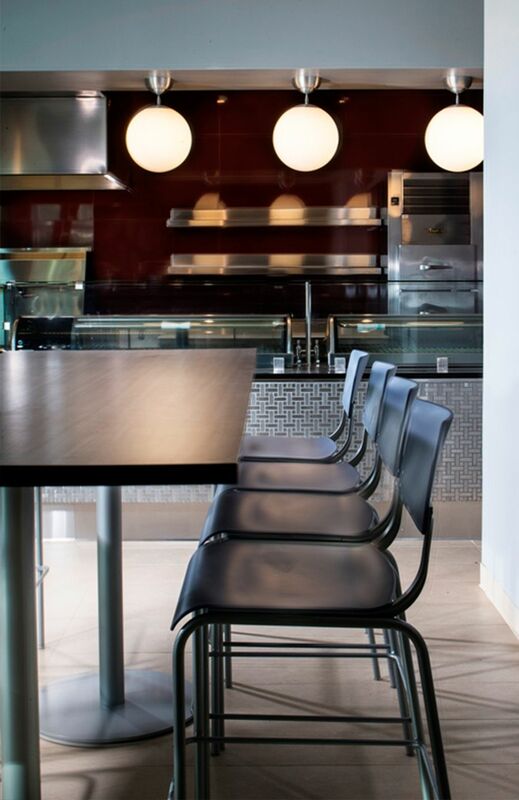 Students now have retail-style dining platforms to choose from and a display-cooking aspect gives them an opportunity to visually connect to the food preparation areas and a stronger sense of the quality of food being served. 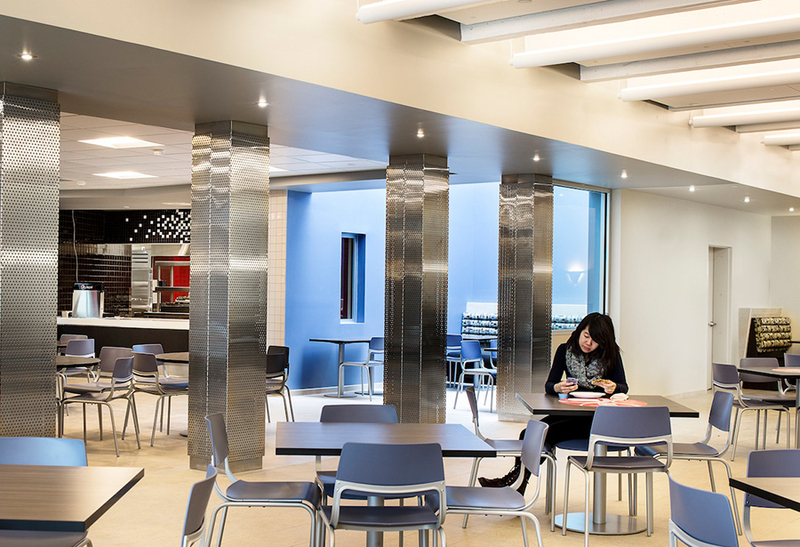 The dining platforms have high-impact but low-maintenance materials such as perforated steel columns, stainless steel counters, quartz tops, and ceramic tile flooring. The LEED Silver project includes environmentally conscious features such as an automated vent hood system throughout the kitchen, a white bitumen asphalt roof, waterless urinals, glass frit, and low e-coating on the curtain wall to decrease sun exposure. Recycled materials, diverted construction waste and water-efficient landscaping were also part of the project’s environmental measures. Awards: AIA Excellence in Architecture –AIA Long Island, 2013, AIA Honor Award –AIA Westchester + Hudson Valley, 2013, AIA Award of Merit –AIA Long Island, 2013, Outstanding Design / Work In Progress – American School & University, 2012. Two KSQ projects are featured in the “Inside Look: Sustainable Campus Buildings” cover story in the September issue of University Business.